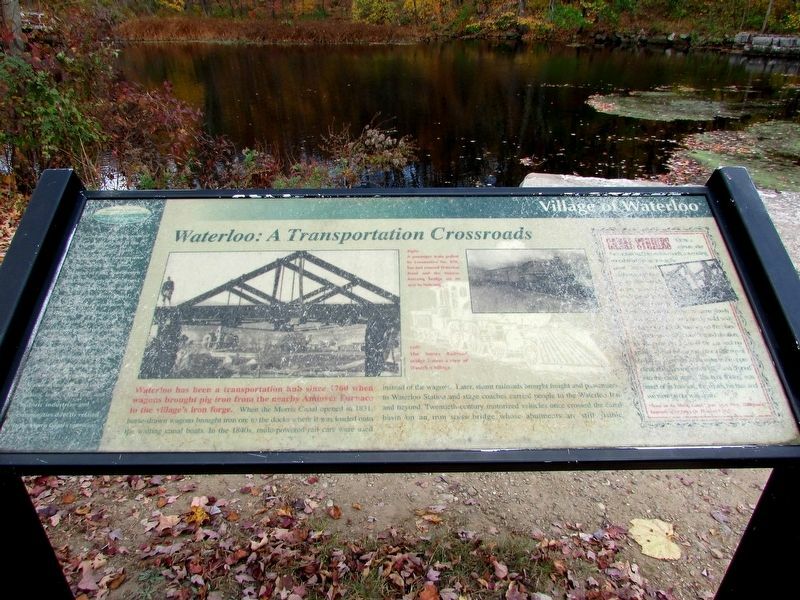 Waterloo has been a transportation hub since 1760 when wagons brought pig iron from nearby Andover Furnace to the village’s iron forge. When the Morris Canal opened in 1831, horse-drawn wagons brought iron ore to the docks where it was loaded onto the waiting canal boats. In the 1840s, mule-powered rail cars were used instead of the wagons. Later, steam railroads brought freight and passengers to Waterloo Station and stage coaches carried people to the Waterloo Inn and beyond. Twentieth-century motorized vehicles once crossed the canal basin on an iron truss bridge whose abutments are still visible. 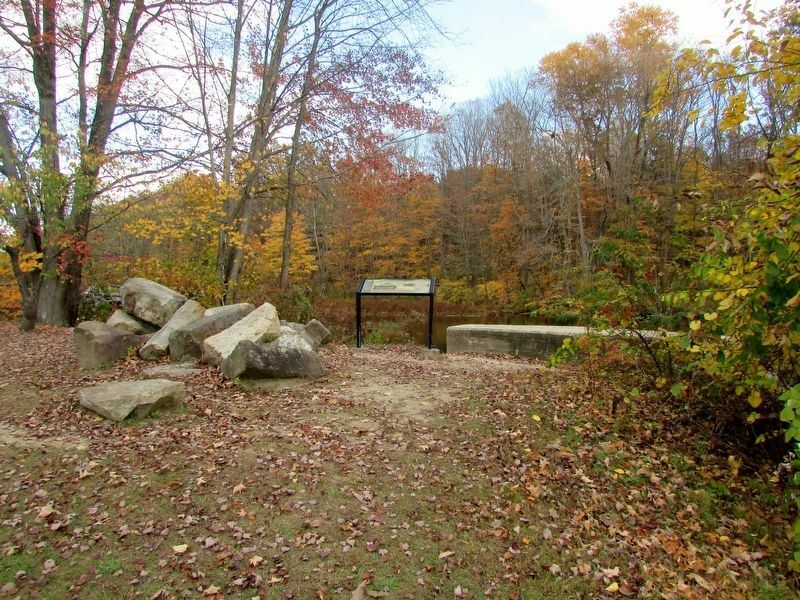 you will see the remains of canal features, including inclined planes, locks, canal bed and historic industries and communities directly related to the Morris Canal’s operation. Location. 40° 54.852′ N, 74° 45.28′ W. Marker is in Stanhope, New Jersey, in Sussex County. Marker can be reached from Waterloo Valley Road, on the right when traveling east. Touch for map. 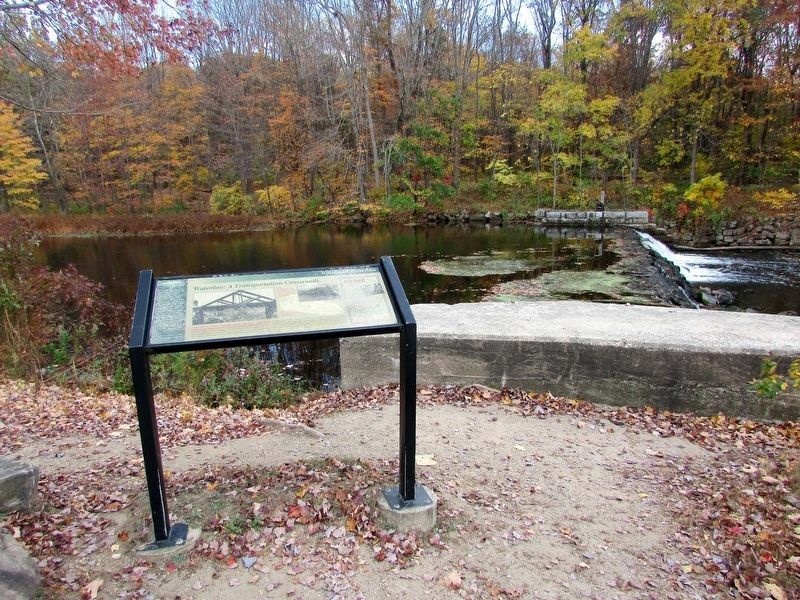 Marker is located in Historic Waterloo Village. Marker is in this post office area: Stanhope NJ 07874, United States of America. Touch for directions. Other nearby markers. At least 8 other markers are within 3 miles of this marker, measured as the crow flies. National Historic Civil Engineering Landmark (a few steps from this marker); The Morris Canal Inclined Planes (within shouting distance of this marker); The Morris Canal 1824-1924 (within shouting distance of this marker); Let This Tablet Honor Them and All Who Live For the Good of the Community (within shouting distance of this marker); Waterloo, A Canal Town (about 300 feet away, measured in a direct line); Cat Swamp Hijacking and Murder (approx. 2.4 miles away); Stanhope, NJ (approx. 2½ miles away); Morris & Essex Line – Netcong Station (approx. 2.8 miles away). Touch for a list and map of all markers in Stanhope. More. Search the internet for Waterloo: A Transportation Crossroads. Credits. This page was last revised on October 22, 2016. This page originally submitted on October 22, 2016, by Bill Coughlin of North Arlington, New Jersey. This page has been viewed 172 times since then and 5 times this year. Photos: 1, 2, 3. submitted on October 22, 2016, by Bill Coughlin of North Arlington, New Jersey.